Take Current Affairs quiz January 30, 2019 to enhance your General Awareness. Practice with our esteemed Current Affairs quiz January 30, 2019 questions which covers all important events across India as well as World. Make use of all important Current Affairs quiz January 30, 2019 questions with answers updated here, at free of cost to succeed in all competitive Exams and Interviews. How much did the Centre alloted for the Andhra Pradesh for drought relief? The Central government allocated Rs.900 crore to the State towards drought relief package to Andhra Pradesh for the 2018-19 Kharif season. What is the name of the probe that is sent to probe the outer corona of the Sun? Parker Solar Probe is a NASA robotic spacecraft launched in 2018 and currently en route to probe the outer corona of the Sun. Which Ministry owns the Bison Polo ground in Secunderabad, Telangana? Telangana High Court said the State government can acquire Bison Polo ground in Secunderabad. The ground is presently owned by the Union Ministry of Defence. Where is the Bison Polo ground located? Bison Polo ground is located in Secunderabad, Telangana. How much did the Centre release to the 6 States and a Union Territory for damage caused by natural calamities during the kharif season 2018-19? The Centre approved the release of Rs.7,214.03 crore to 6 States and a Union Territory for damage caused by natural calamities during the Kharif season 2018-19 from the National Disaster Relief Fund. ISRO has named 10 companied to manufacture the ________ cells developed by the Vikram Sarabhai Space Centre (VSSC). The Indian Space Research Organisation (ISRO) plans to transfer the technology for manufacturing Lithium-ion cells developed by the Vikram Sarabhai Space Centre (VSSC), Thumba. It has named 10 companies to manufacture the Li-ion cells. George Mathew Fernandes who recently passed away is a famous ________. George Fernandes was an Indian trade unionist, politician, journalist, freethinker, and member of Rajya Sabha from Bihar He was a former Union Minister. He was a key member of the Janata Dal and the founder of the Samata Party. On which of the following states did the NGT impose Rs.10 crore fine on each due to dissatisfaction with Yamuna Cleaning? National Green Tribunal (NGT) imposed Rs.10 crore fine on Uttar Pradesh, Haryana, and Delhi. Which bank to inject Rs 37,500 crore through OMO in February? Reserve Bank of India bank to inject Rs 37,500 crore through OMO in February. Who is the CEO of Food Safety and Standards Authority of India (FSSAI)? Pawan Kumar Agarwal is the CEO of Food Safety and Standards Authority of India (FSSAI). Which State won the Best State Award for its active participation in the Swasth Bharat Yatra? Tamil Nadu has bagged the Best State Award for its active participation in the Swasth Bharat Yatra, a pan-India cyclothon. It aimed at promoting the concept of ‘eating right for a healthy life’. Uttarakhand's First Tulip Garden In ----------? Uttarakhand's First Tulip Garden In Pithoragarh. Which country appoints Its First Ever Female Hindu Civil Judge? Pakistan appoints Its First Ever Female Hindu Civil Judge. Which country bags The Award of Excellence for Best in Show At NYTTS 2019? India bags The Award of Excellence for Best in Show At NYTTS 2019. Which country replaces Japan to become second-largest crude steel producer? India replaces Japan to become second-largest crude steel producer. Are you looking for right place to enhance your Knowledge on Current Affairs of 30th January 2019 through effective Quiz section? 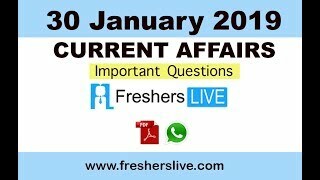 FreshersLive grants you the advantageous Current Affairs Quiz questions with accurate answers for 30th January 2019 which covers all the important events, supreme Awards, major occurrences in the National as well as World level. All important Current Affairs Quiz questions of 30th January 2019 are updated instantly in this page. Everyday at least 25+ Current Affairs Quiz Questions are displayed in this FreshersLive page. Correct Answer for each quiz question is given at the end of the entire 30th January 2019 Current Affairs Quiz questions section. You can estimate and upgrade your GK by attending these useful quiz questions. Entire quiz questions of 30th January 2019 Current Affairs covers Competitive Exam as well as Interview point of essentially important topics like International News, National News (ie. Indian Affairs), Science & Technology News, Environmental News, Bills & Acts Passed by Government, Defence News, About important Persons, Places, Banking & Economical News, Awards & Honours, Sports News, Revolutionary Updates on Arts & Culture, Obituary, Summits & Conference, Important Committee, Schemes, Appointments, Important Days & its Theme for Current as well as upcoming Year, Books & Its Authors, Agreements & MoUs, Budget, Taxes, Various Important Lists & Indexes, Visits by World Presidents, Prime Ministers, Political affairs and all Current Events. 30th January 2019 Current Affairs Quiz Questions updated in this page are prepared in the sense to help all aspirants to succeed in various Competitive Exams like UPSC IAS and other Civil Services Examination, Various Bank exams like IBPS PO, IBPS Clerk, SBI PO, SBI Clerk, RRB PO, RRB Assistant, Insurance exams like LIC AAO, UIIC Assistant, Railway Exams, Various Central Government Exams like SSC CGL, SSC CHSL, and more. Attempt all the Current Affairs Quiz Questions of 30th January 2019 and evaluate your score by matching your response with the correct answers mentioned at the end of this quiz questions section. By practising the FreshersLive Current Affairs Quiz Questions on a daily basis, you can surely succeed in the competitive exams as well as the interviews easily. Make use of this ultimate resource to the fullest and quickly achieve your goal!